voyage through the architect’s subconscious. example of how to breathe life into a staid old structure. And its interiors underscore one of the most underrated dimensions of Mr.
balance exuberance with delicious moments of restraint. heavenly light pours into the space from two stories above. disappears and then returns. It’s as if you were riding a wave. are brought lovingly back to life. It’s opening day today and Dundas Street has the feel of one of the gala film festival openings with police directing traffic and people lined up down the block. Even at 1pm, there was a line under half of the entire Galleria Italia overhang (that front porch Gehry talked about yesterday) in anticipation of the 4pm grand public opening. Torontonians, it would seem, are excited and eager to get inside. Outside half of McCaul is closed down for a street party, and along the line a handful of artists were capturing the scene. After a few years of this stretch of Dundas being closed to the public, inhabited only by hard-hatted workers and big machines, it’s nice to see it so full of people again. As it should be. The AGO opened its doors the media yesterday with a press conference featuring Frank Gehry and Matthew Teitelbaum. Press previews are strange events — you can feel the anxiety in the room. Everybody is trying to get the quote and money shot they need, then hurry back and package it for the evening or morning news. As was pointed out to me by a television producer, it’s also a room full of rivals. If there ever was a crowd destined not to enjoy themselves, this was it — it’s work rather than a fun day at the gallery. Still, there seemed to be as many of the childlike awe-moments as there were during member preview days (looking up in the Walker Court at the new staircase, looking out the back of the Barnacle Staircase at a Toronto Skyline never seen from this angle). As you can read for yourself in the AGO in the news post below, the media have largely fallen in love with the building. Gehry, looking very California casual, fielded questions for about a half hour, often joking about his Canadian and neighbourhood roots. At one point — a clip destined to be used for years to come — he said he thinks this is indeed a real Frank Gehry building. Later I took a walking tour of the building with Craig Webb, one of the partners in Gehry’s firm. Most interesting is that Webb talked about the art as much as the building, indicating they spent a considerable amount of time thinking about what and who was going to into the building as much as what it looks like from the outside. Also while on the tour I got the feeling that Ken Thomson’s ghost is everywhere in the building. Webb and other Gehry architects seemed to get into his head and understand his personality so much that by mid point in the tour, I felt like I was walking through Thomson’s living room, looking at his various objects, laid out exactly the way he wanted. Flurry of music. Bankers, starchitect & CEO take stage. Under massive staircase, just hanging there. Reached new fundraising goal of 276 million dollars. Building is paid for. 3500 donors. TV producer next to me confused by hammering sound from below. Gehry on stage. Only one not in suit. Seems like most avuncular of starchitects. Now he talks. Gehry gives cute wave. Sez he’s a laid back Canadian like Ken Thomson. “He was frugal in a sweet way”. Wants kids to come to AGO. Wanted to create porch on Dundas. Says streetcar going by is like being in same room with it. Panel questions. Never hold a microphone upright in your lap when sitting on stage. French reporter just asked question in French to people who don’t speak French. Ballsy. Writer from Fab asks about G’s fascination with fish. G wonders if Barton Myers (previous architect) is “pissed off” at him. Also Alsop enabled the tower over grange park! Wished for more $. G says entrance fees from $15 going up to $18 is “highway robbery”. Free passes will be given to new Canadians and students after school. Spent 20 min wondering where washroom was. Nice though, once I found it. The press do not like being told the can’t take pictures. Many galleries designed to be lit with natural light. Calculated brightness and will close shutters when needed. Following a Californian talking about Toronto. Neat view on our city. Little more frank about things? Not Gehry Frank, but frank frank. People asking why no trees? No space is answer. Ribs on front fan out from centre. Put railings in the Kreighoff room so people could lean into paintings. An experiment. Ruben’s “Massacre of the Innocents” more violent than video games or True Blood. Craig Webb has great California haircut. Architectural. Wait, it’s Bilbao hair, totally. There has been a lot of great media and blog coverage leading up to the public opening of the new AGO. Today (Thursday) is the press preview of the new AGO. Architect Frank Gehry along with the AGO’s Matthew Teitelbaum will be hosting a news conference followed by various press-sorts-of-things. I will be Twittering the events of the morning and early afternoon — either check this page and follow along via RSS feed, or if you Twitter yourself, follow me the “traditional” way (you know what to do). As with all live-Twittering events, it may be a terribly boring exercise, but I will try and report on interesting moments and quotes. There may also be occasions when I ask for input from fellow Twitterers. In the evening Transformation AGO — and Toronto architecture in general — will be the subject of an entire episode of the TVO program The Agenda with Steve Paikin from 8-9pm. Guests include Architecture critics Lisa Rochon and Christopher Hume, Toronto City Councillor Kyle Rae, and myself. We will be talking about how new and old architecture can exist together in Toronto. They are encouraging folks to go to their website and email in questions — if there is time during the broadcast they will be used on air. Photo “AGO Remixed” taken by amazing Toronto photoblogger Sam Javanrouh. The AGO was open for three days this week for the members preview. It was fun to wander around the gallery (apart from exploring it myself) and watch people get used to the new building while it is still being finished. I had a map in hand, but was happy to just try and get lost inside and see what I find. That’s something you can easily do at a museum or gallery in another city that you’re visiting for the first time, but not so easy at one in your own city. These first visits are somewhat special because of this. Many parts were off-limits or behind yellow caution tape, including the Walker Court (everyone seems to be wondering how the spiral staircase works in there) as well as the two exterior staircases, as they were still under construction. My feeling is most people enjoyed seeing the organized chaos of an unfinished building, a sort of peek into the behind the scenes of how the gallery is not just built, but how it’s run. Construction workers were everywhere as were gallery workers installing various artworks (almost like some kind of meta performance piece on gallery life). That art work is safe though, don’t worry, security is watching everything like a hawks in nice suits. Three minutes into the museum I was taking notes on my iPhone and could tell I was being followed. Sure enough, I was politely reminded that I couldn’t take any pictures. I said “of course, just taking notes,” but I don’t think he believed me entirely. The temporary protective box around Two Large Forms, the Henry Moore sculpture that has sat at Dundas and McCaul since 1973, has been removed and the piece is again a familiar part of the city. It was moved to the south a few meters to accommodate the new addition but it will likely again fall into its roll as either: a nice piece of abstract sculpture for art lovers; a strange playground slide for children; or something OCAD students can lean up against when making out after a late night class. I often wonder if Moore knew that his piece would become a sort of art-ambassador, introducing people to abstract forms who might not otherwise go into the the AGO and see the rest of the collection — or maybe many did after seeing this piece. Toronto has a long relationship with Henry Moore that was mostly happy (the AGO houses the biggest public collection of Moore’s work in the world) but was sometimes contentious (as during the fight in the 1960s to install “The Archer” in front of New City Hall — quite a few people just didn’t want public money used on art — sounds familiar?). The role this piece plays reminds me of the Picasso sculpture found in the Daley Civic Center plaza in Chicago. A bit puzzling when first installed, but quickly becoming a loved part of the urban landscape, and one kids can play on. Two Large Forms at the AGO is a bit of a tease though — we can’t climb on any of his pieces inside, even though some of them seem to be asking for it. A common complaint heard from Torontonians and visitors to the city is that we have too many utility poles scattered around our sidewalks. In an article today on Spacing Toronto, Megan Hall writes about city’s ongoing policy to remove or consolidate poles where and when possible. As she points out in her article, it’s a difficult task to coordinate as each pole may belong to a different agency and often TTC streetcar poles must remain in order to keep the Red Rockets running. In front of the AGO all the poles have been removed because the building itself is being used to anchor the overhead wires. 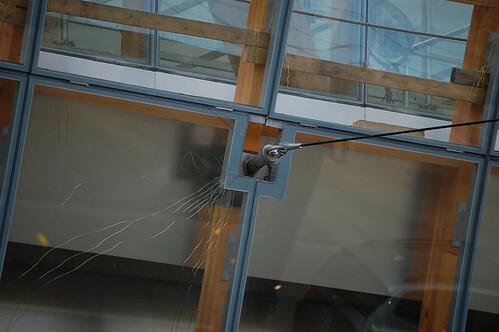 As the tension cracks in the photo above suggest, installation of this new way of suspending streetcar wires from an oddly shaped building is not without its own challenges (see Torontoist for more pictures of the glass replacement). The effort is worth it though — once completed the curved front of the AGO will be one of the few buildings in Toronto that can be viewed without obstruction. It’s also an interesting detail to note — often with massive renovations like Transformation AGO we talk about how it will change or affect the city in macro terms — here is one of the smaller ways the AGO is changing the city’s public spaces for the better. As the opening nears, there is lots being written about the AGO building and the collection within. Here’s quick round-up of a few more articles published over the last few days.-In the Globe and Mail, James Bradshaw writes about a new private collection of 40 works of art donated by individuals and families, as did Martin Knelman in the Star. 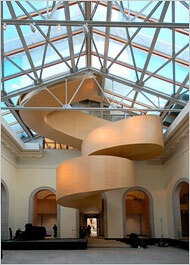 -Robert Fulford wrote a long piece in Saturday’s National Post describing Frank Gehry as both architect and artist. -Today Martin Knelman has a quick opinion piece on how the AGO has transformed, borrowing the “Yes We Can” phrase from Barack Obama. -Over, under, around and through the new AGO, an overview of the building and how the architecture, programming and organization is all going to work.-Over at BlogTO, Tim wonders if journalists will use the opening of the new AGO to take a few shots at the ROM.